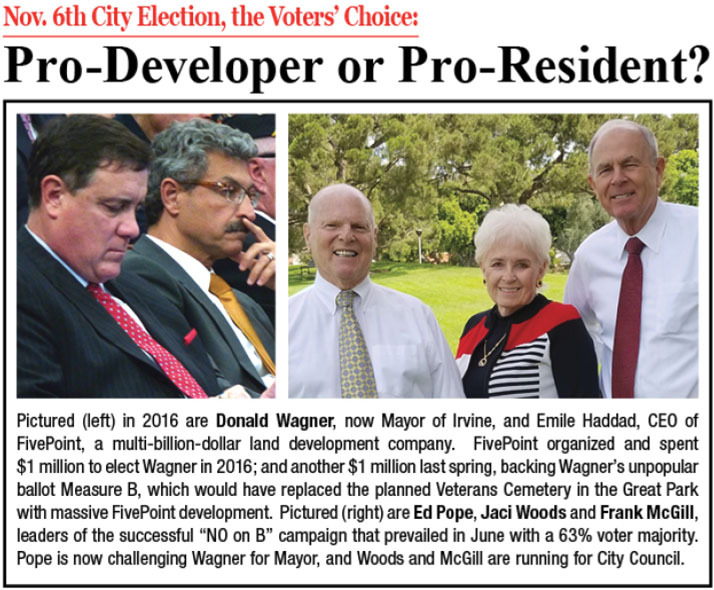 With two open seats on the Irvine City Council, and Mayor Donald Wagner seeking re-election, Irvine voters will be making a dramatic choice on Nov. 6th: to maintain a pro-developer Council majority under Mayor Wagner… or to elect a new pro-resident Mayor and City Council. 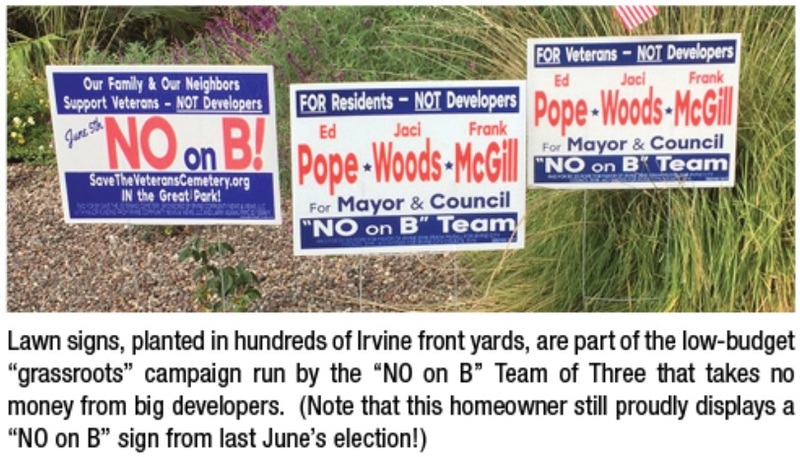 Pope, Woods and McGill were all leaders in the NO on B referendum campaign. 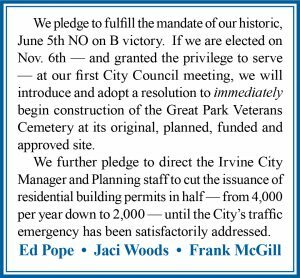 Measure B was the major zone change ordinance — put forward by Wagner and developer FivePoint — to actually replace the carefully planned 125-acre Veterans Cemetery in the Great Park with nearly 1 million square feet of office, industrial, and apartment development, bringing an added 10,000 cars and trucks to northern and central Irvine every day. 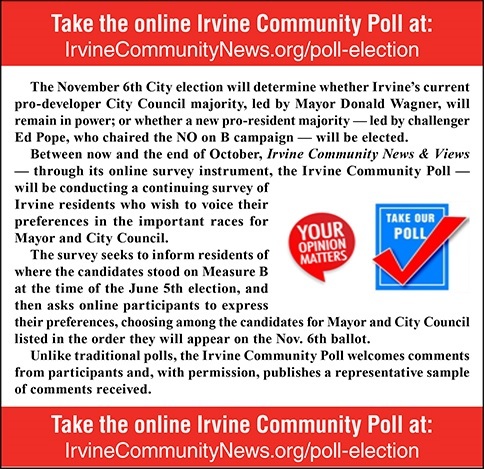 On June 5th, in what was plainly a voter revolt, the Wagner-FivePoint development scheme was defeated by Irvine voters, 63% to 37%, despite the fact that FivePoint and their developer allies spent more than $1 million pushing Measure B on the Irvine electorate. 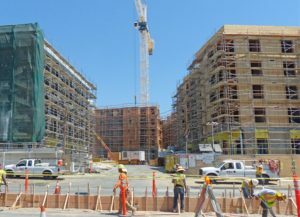 These south Irvine apartments are among thousands of units built in 2017-2018. FivePoint spent more than $1 million to elect Wagner in 2016. Most observers believe FivePoint is prepared to spend the same amount all over again — not just to re-elect Wagner, but to support Anthony Kuo, Carrie O’Malley, and Lauren Johnson-Norris for City Council. 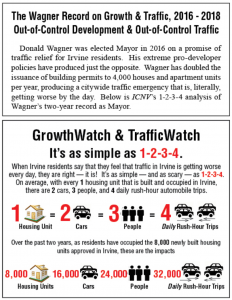 All three publicly lined up in support of the Wagner-FivePoint Measure B development scheme. FivePoint and their political operatives have seen to it that Kuo and Johnson-Norris have received many thousands of dollars in campaign help. 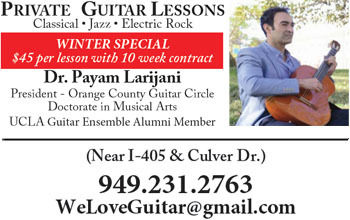 PreviousCityWatch (October): The Decision is Yours • VOTE! NextOpen Forum FREE SPEECH FOREVER!